The Travel Activity Book is the perfect addition to a child’s holiday suitcase. 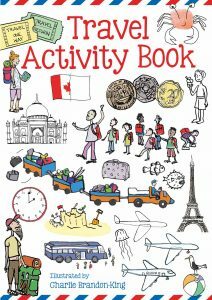 It’s packed with lots of fun holiday related activities which provide information about various aspects of travelling and are perfect for keeping a child entertained on a long journey and we have three copies to give away! The activities are printed on thick, sturdy paper and Charlie Brandon-King’s illustrations are full of amazing details. There are mazes, dot to dots, ‘how to draw’ instructions, spot the difference puzzles and opportunities for a child to create their own tickets, money and flags. The Travel Activity Book includes some great learning opportunities. 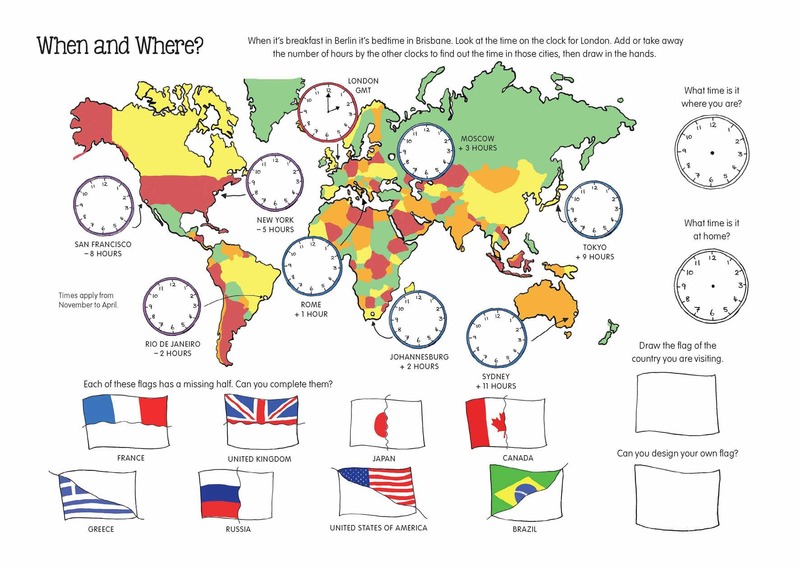 We love the page which introduces the different cloud formations you may see as you fly and a map of the world gives children the opportunity to work out the time in various different countries as well as introducing different flags. Once we’ve decided what to pack in our suitcase we can go to the airport or the jungle. 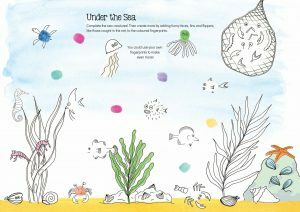 We can play in the park, on the beach or dive under the sea. And of course a holiday isn’t a holiday without icecream, there’s a page where you can design your own. The great thing about this book is that there are two copies of each activity which is brilliant for families with two children, there will be no arguments as they can both do the same pages! The pages can also be easily torn out as can the eight postcards at the end of the book. The postcards can be coloured or you can draw a picture of something that you see while you are away. A list of ‘Games to Play on the Move’ is included on the inside front cover and on the back you can draw your favourite holiday memories. My daughter couldn’t wait to get started on the activities. She was immediately drawn to the mazes, the works of art shadow puzzle and enjoyed finding crabs on the beach. 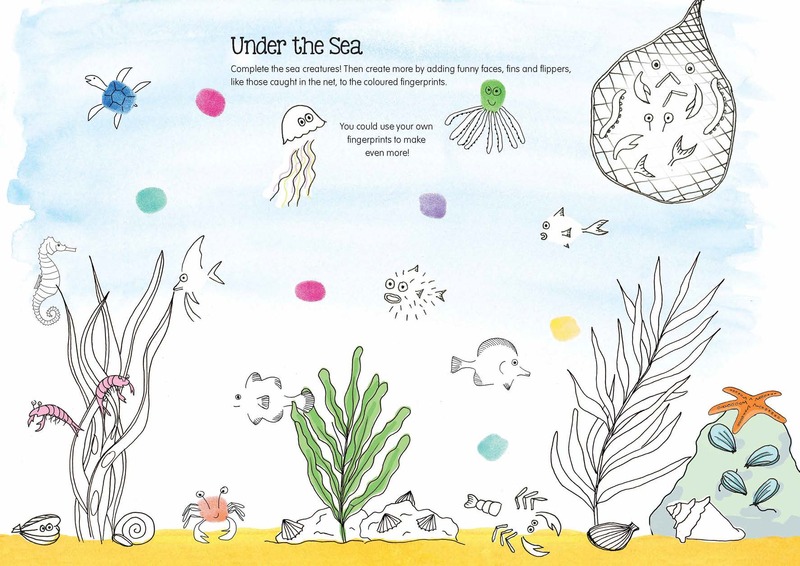 There are lots of fun activities to choose from, one of my favourite pages is the Under the Sea page where you can create your own fingerprint sea creatures. This is definitely a book we’ll be packing for our next holiday and we’re very excited that we have three copies to give away. You can enter the giveaway here. Thank you to GMC for sending us a copy of the Travel Activity Book which will be published by Button Books in April. A huge thank you for giving away three copies of the book to our European readers who can enter to win a copy in time for the Easter holidays. This looks fab – I think my 8 yo would love it. Love the talking point of what time it is across the world! This looks really cool! I love that there are two of each page too – clearly made by someone with two kids like me! It’s a great idea isn’t it, no more fighting over who is going to do which page!! This sounds and looks like a really fun book….Perfect to keep children busy. This looks like something my kids would really love. It is and it’s made with really good quality paper to withstand travelling too. There are some really original activities in the book too as well as lots to promote learning. It’s great that there are two of each activity. Such a simple idea, but a lifesaver for frazzled parents! Oh wow it looks great and something that will keep the kids amused for a long time! This sounds a must. Am going to order a copy for the grandkids to take on their hols. These look perfect for taking on holiday or for keeping kids amused along the way.